Bring the superb beauty of Pennsylvania Amish Country to your bar or counter with our Amish Metro Barstool. No stone has been left unturned in the construction of this superior piece. Investing in Amish furniture means investing in the best! Because you are choosing well, you will be able to buy less and enjoy furniture that is truly built to last. The unseen chair underside of the Metro is a perfect example of how no corner is cut in its craftsmanship. Extreme care is taken in making sure this barstool meets even the highest standards. Its mortise and tenon construction will allow you to enjoy the Metro for generations. Select from our wide variety of solid hardwood and choose from an array of finishing packages to suit your home's style. With our various options, you will be able to create the American home furniture of your dreams! Consider the exciting Metro Pub Table for a perfect pairing with this barstool. And please feel free to get in touch with a friendly Amish furniture expert to discuss any and all questions: 866-272-6773. If Elm/Clear Maple – S wood option selected, elm will appear on chair seat and upper back (or bow) only, on both wood and upholstered chair backs. Only locally grown American Hardwoods are used in the construction of this furniture. Hardwoods are harvested only from responsibly managed forests for long term environmental sustainability. 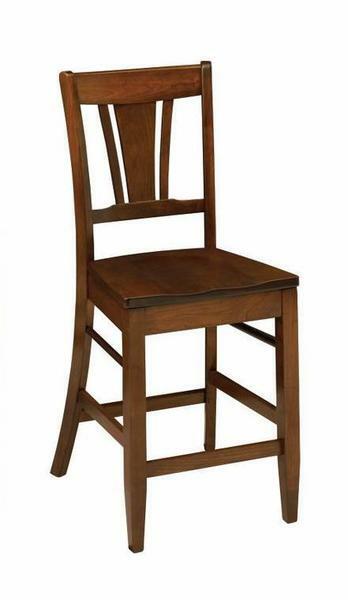 Rugged triple-grooved corner braces combine with specially formulated glue and industrial strength lags to give these chairs more than a life-time of durability and functionality. In addition to precision fitted parts, our extra step of inserting a screw through the legs and stretchers assures you a life-time of trouble-free, wobble-free chairs. Shown in Cherry wood with chestnut stain.